The Chisholm Trail represents the same multi-state region that our firm represents. Cattle were bought for $1 in the Rio Grande Valley and were driven north to Kansas and shipped by railroad to the East. It cost $10 to make the drive and the cattle were sold for $20 in the East. The first stock holder reports were telegraphs to Eastern investors, letting them know how many head of stock survived the winter. There were multiple trail drives that either lost or made money. 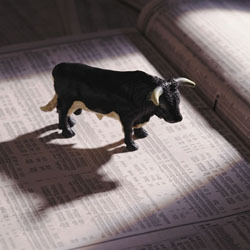 The bull is a well-known symbol of the stock market charging forward. The cowboy is a well-known symbol of America. They overcame many obstacles to reach goals. The prominent star brings to mind the safety that was represented by the marshals badge. The star has 5 spokes similar to a wagon wheel. The space between the two bars symbolize the ruts ground into the limestone from the many wagons that safely crossed the Brushy Creek next to the Round Rock. The points of the star represent multiple financial goals in your life where you may lose or make money. Each point has half that is blue. The blue are landmarks while you are alive. The gold half represents landmarks that could be passed on using the principles of stewardship. The gold is the legacy that will be passed on. The circle around the star is the same shape as the Round Rock. Today the rock is slightly offset from the bridge, (the 2 bars), which allows a safe crossing. The Round Rock is a landmark that insured a way to safely navigate the Brushy Creek, an obstacle on the way up the trail to success. Our Company is a landmark that ensures a way to safely navigate obstacles on the way to financial success. 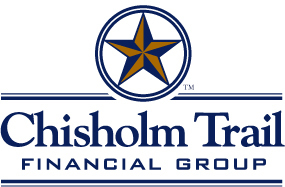 "Chisholm Trail Financial Group, a landmark for financial success"